With an accessible starting MSRP from just $18,550*, the 2018 Toyota Corolla is one of the smartest choices on the market for Pooler drivers looking for a safe yet economical sedan. Every model gets the Toyota Safety Sense™ P (TSS-P) package, as well as the Star Safety System™ and a full suite of airbags. Explore the 2018 Corolla’s sophisticated safety features with help from Savannah Toyota, a certified Toyota dealership serving drivers all throughout the Lowcountry. Complete with a Pedestrian Detection (PD) feature, this system is able to recognize an imminent collision and intervene to help reduce the chance or severity of a potential accident. Using advanced cameras and sensors, the Lane Departure Alert system also includes Steering Assist (SA) to warn you of drifting and help automatically steer you back to the center of your lane. When activated, this feature is able to automatically accelerate and brake in order to maintain a pre-set distance between your vehicle and the one in front of you. This feature uses sensors to automatically switch between regular beams and high beams based on whether or not another vehicle is detected in the vicinity. 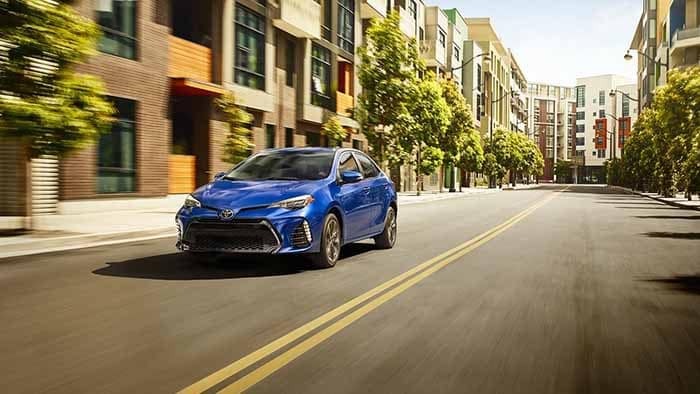 For all these reasons, the 2018 Toyota Corolla, and any Corolla trim level, is sure to be one of the most popular cars on the roads of Bluffton, and, best of all, it’s available right now at Savannah Toyota, located at 11101 Abercorn Street in Savannah, GA. Our dealership is open Monday through Saturday starting at 9:00 a.m., so contact us online or by phone at (855) 411-6139 to set up your test drive today!